"Springboks/ New Zealand / England" - 1994. 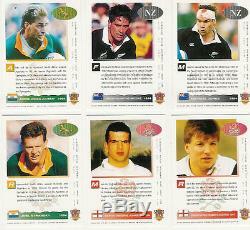 A set of 90 cards featuring Springbok, All Black & England players. The set is made up of 42 Springbok cards, 24 All Blacks and 24 England players. The card size is 63mm x 89mm. Full set of 90 cards loose. The item "SPORTS DECK (South Africa) RUGBY CARD SET 1994 Springboks New Zealand England" is in sale since Wednesday, March 13, 2013. This item is in the category "Collectables\Trade Cards\Other Trade Cards". The seller is "rugbyrelics*com" and is located in UK - ship next day. This item can be shipped worldwide.